Wow, time’s flying. I can’t believe it’s already February. It’s also time for another IWSG post. 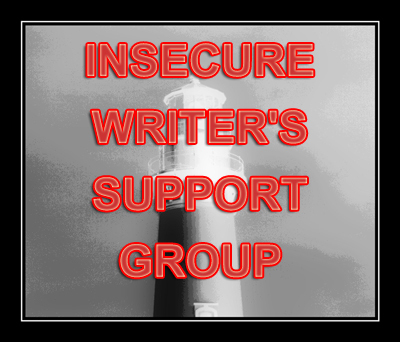 For those of you who don’t know, IWSG is a bloghop hosted by Alex J. Cavanaugh, where writers share their insecurities and encouragement once a month. It’s never too late to join, so if you want to, go here. On the night of 26 December, 2011, I suffered the most catastrophic loss of data ever. I’d used a certain freeware program to do all my rewrites, which added up to well over one hundred thousand words. After many attempts, I managed to save a few chapters of some of the projects. But the original rewrite of Doorways was gone. Luckily, I’d already started to edit at that time, so I had a copy if I declined all edits. What broke my heart was this. I’d written a western that year. I rewrote it too. I finished the rewrite on 24 December. I lost: Every. Single. Word. Of all the words I wanted to recover, that project was it. It broke me. Really. Sure, I went on with all the other projects I saved, but I just didn’t have the heart to start the western again. So I postponed the rewrite to 2012. Didn’t happen. And 2013. That didn’t happen either. But this will be the year. In fact, I’m going to read the rough draft today. By the end of the week, I want the first words of the re-rewrite down. Thing is, I have this horrible thought. I’d loved the rewrite. I thought it was touching, and emotionally rich and brilliant. And I know that theoretically, I should be able to make this rewrite even better. Except… what if I can’t? What if I lost its heart and soul that night? Needless to say, I know I’m being stupid, but the idea of opening that rough draft fills me with trepidation. Nothing to do but start, though. Have you ever lost a project and delayed starting it again due to insecurity? For C-day, I introduced you the third most dangerous creature to your muse. Today, I’m introducing you to the first two. They’re terrible. Terrifying. And they’ll ruthlessly efficient in making your words churn to a stop. Problem is, the shovel-solution won’t work. Well it would, but it won’t help you write. Because… well… you’ll be passed out. And you’ll wake up with a concussion. The reason is that your two worst threats live inside you. Description: The inner censor functions by making you doubt that anything you’ve written should see the light of day. “Take out that curse word!”, “The story is too violent.”, “Do you really think anyone would read this?” are common cries by this voice. Then there’s its little friend. Description: Inner editors thrive on weaknesses on your writing. The more you listen, the louder the voice becomes. “This character is two dimensional.”, “This plot point is weak.” and “There’s not enough conflict” are common cries. Why would inner voices be so dangerous? More than half the time they speak, they’re right. Or at least, right enough that you might want to listen to them. And then… you “fix” your book. The inner editor’s threat seems smaller, but time and time again, I used to destroy my story’s soul in first draft because I “fixed” stuff my inner editor pointed out. So what do you do with these frenemies? It’s actually difficult. And it depends on your writing method. I lock them up until after my rewrite. That way, I can focus on discovering the story without worrying about anything else. Once revisions start, though, I let the censor and editor out. And then I listen to their complaints. I measure them on their merit. Some, I actually do take into account and I adjust my story accordingly after edits. Others, I just say: sorry… but I disagree. And then I ignore it. Usually, the bits I did change is enough to keep them at peace during edits. Still, I suspect everyone deals with their internal frenemies in their own way. So, veteran novelists, please share your methods so the new kids can pick up some tips? And new kids, feel free to ask questions. I’ll do my best to answer. And vets, you’re welcome to answer them too.